Nous n'acceptons maintenant que les réservations pour 2 adultes dans le duplex. Les réservations sont acceptées pas plus d'un an à l'avance. Grande salle de bain, rempli de serviettes; savon liquide pour les mains fourni. Ceci est un duplex (2 unités d'une chambre), le niveau du rez de chaussée. Si ce calendrier est plein, s'il vous plaît voir l'autre villa i # 3003070. A l'arrière de l'établissement est une maison de 3 chambres. Cela peut être consulté sur Home Away # 339739. Ces 3 unités partagent la piscine et le patio. Il y a une laveuse et une sécheuse communes disponibles pour les unités duplex. Il y a deux chaises de plage et un buggy de plage pour chaque villa. Un parking privé pour votre véhicule directement en face de votre villa. A little spot in paradise. Me and my wife just recently stayed here in villa 2, and our stay was just perfect! It’s close to everything, the beach access is awesome! The unit itself was great! It was perfect size for us and very nice and updated. The pool area was a delight as well. The owners were so helpful and courteous, very warm and nice people. I would definitely recommend the villa!!! This place was perfect for us! Within walking distance to the beach and to the village. I loved the front porch. It was well equipped with everything you need for the beach and pool. We shared the pool with our neighbors who were so very nice. I would recommend this place abd would definitely stay there again. Thanks for your endorsement of the Siesta Jewel! The best thing about this property is it’s proximity to beach access and to Siesta Village.The screened porch is nice and the shared pool is a plus. My only complaint is that the queen bed is very squeaky and uncomfortable. We love the Siesta Jewel and our time there. We love the porch and he quaintness of it. The owner Cheryl has been wonderful and is a large part of our experience . Everything has been well maintained and updated when needed. We love the shared pool and meeting our friends that have also discovered this gem. We’re so glad you found us 9 yrs ago. You started as guests and became friends— we look forward to the weeks that you come and stay every winter. Many thanks to you and Janet for telling your friends about us! Thanks for the Review! We have just spent our 8th February at the Siesta Jewel and again have enjoyed every second of it. As always, we found the place immaculate, with everything we needed for our comfort, for the beach or pool. Cheryl, the owner, does an exceptional job of reacting to any need that may come up during your stay. By far, the best feature of the Jewel is its location. Besides having your own pool, you are only 2 blocks from the village for your choice of restaurants, entertainment and ice cream or 1 block from the beach for walking, relaxing and beautiful sunsets. Our time at the Jewel has always been one of the highlights of our year. We look forward to coming back for many more years. It’s always been such a pleasure to have you stay with us over the years. 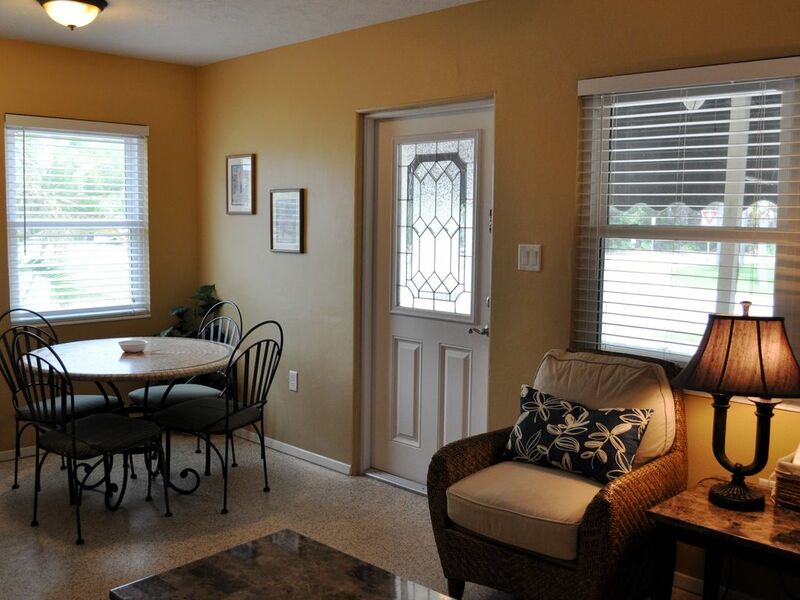 There are plenty of places to stay in Siesta Key, we’re so glad you chose the Jewel! This was our 3rd stay in this unit, and we are signrd up to stay here next year. Wee just posted a review Jan 2019 for our stay then. Les belles plages de sable blanc à base de quartz qui se sent poudreuse douce et fraîche aux pieds! Couchers de soleil à couper le souffle. Restaurants, vie nocturne, des boutiques et la crème glacée dans le village. Apportez vos tongs, vous ne aurez pas besoin de votre voiture! Changeover day is SATURDAY Reservaion/Damage deposit of $150 required. The deposit is refundable within 1 week of departure if no damages are incurred. Refund will be returned to the source from which is was drawn (ie; credit card or debit) We use Reservation Manager for online payments No rentals will be granted to vacationing students or singles under 23 unless accompanied by an adult guardian or parent.